Greyhound Awareness League is a Glasgow based charity which works to rescue ex-working and ex-racing greyhounds and lurchers, finding them loving forever homes. Many of the retired racing dogs that come into their care are injured or too old to race, and have been abandoned or neglected. Alongside rescuing, caring for a finding homes for the dogs, they also work to raise awareness among the public about the suffering of retired greyhounds. The charity was initially founded by Denise McGranaghan in 1998, after adopting a greyhound named McLeod along with her husband. 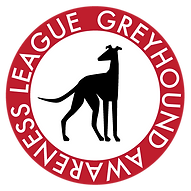 After they welcomed McLeod into their lives, she decided to find out more about the lives of retired racing and working dogs, and was inspired to create the Greyhound Awareness League. The GAL is entirely run by volunteers, whom have a passion for rescuing these wonderful animals and finding them new homes. All dogs rehomed are given complete vet checks with any necessary dental work, and are microchipped, neutered and vaccinated. Supporting GAL means they can continue to rescue and rehome the dogs. Many of the dogs have been rescued from the racetrack due to age and injury, which can be costly when it comes to vet bills. They also keep some dogs permanently in their care as they never put a healthy dog down, so some with permanent behavioural or medical issues are kept in their care for the rest of their lives. Find out more about how you can support the Greyhound Awareness League, and the dogs they currently have up for fostering and adoption by visiting their Website.